Boston enters the final weeks of the Hot Stove stretch having done relatively little tinkering with its roster this offseason aside from resigning Mike Napoli and coming to terms with free agents A.J. Pierzynski and Edward Mujica. The Red Sox have a number of Top 100 prospects in its minor league ranks who are expected to contribute this season. Xander Bogaerts and Jackie Bradley Jr. are forecast to see full-time duty while the club also has a few pitchers (Matt Barnes, Allen Webster, Anthony Ranaudo) who could be pitching meaningful innings by the summer if the back end of the rotation doesn’t pan out. The Red Sox were evidently the only team willing to give Sizemore a significant major league contract. He will earn at least $750,000 and if he somehow supplants Jackie Bradley, Jr. as the starting center fielder and performs well, he could make up to $6 million. The signing of Grady Sizemore is an indication that they are ready to give Jacoby Ellsbury’s former job over to Jackie Bradley Jr., but it also shows that they are prepared with a backup plan in case that doesn’t pan out. Some would say that Sizemore is hardly a backup plan as he could very well end up injured, which is absolutely true, and that an outfield of Gomes LF, Victorino CF, and Nava RF would happen in the event of Bradley turning out to be a dud. But with Sizemore comes a tremendous amount of upside. Five years ago he was a 30-30 player and a gold glover in the outfield. In addition to the Sizemore signing, which generated the most fanfare, the Red Sox also made a series of minor moves to round out the roster, trading Franklin Morales for Jonathan Herrera and making pitcher depth signings in Jose Mijares and Jose Valdez. In an interview on Monday at the station’s headquarters, the NESN color analyst said that as recently as December, he thought he was finished. However, he has had a change of heart since the New Year as family and friends implored him to come back. Boston may as well accept that Ortiz’s heroics and prolonged popularity allot him a unique amount of leverage. He is unlikely to ever be OK with entering a given spring with his current contract due to expire six months later. His public ploy for another extension is absolutely an opportunistic money-grab. But, really, what is it worth pride-wise for the organization to take a hard line? One of these years, Ortiz is going to lose enough bat speed and become a lousy hitter. At that point, he will become a sunk cost, dead money on the Sox payroll. But it’s at least worth noting, as Pete Abraham noted on Boston.com earlier this week, for all his contributions to the club’s success, Papi’s salary has averaged only about $10 million per year over the past decade. The amount of cash it will take to forego this annual conversation until, probably, next spring amounts to a rounding error for the team. 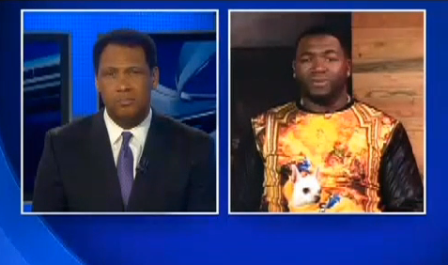 And it’s hard to argue that it sets a dangerous precedent because nobody else is David Ortiz. He is the only guy who can get away with this kind of yearly posturing. As the team has come to find out, he damn well knows it. And of course, Papi looked especially villainous during this latest round of posturing thanks to giving his interview with WBZ while holding a small dog in his lap a la Dr. Evil. Los Angeles, New York and Chicago were reportedly the three most active bidders in the Tanaka sweepstakes. The Yankees’ 7-year, $155m deal with Tanaka screams desperation. New York probably would have been smarter to sign a few shorter-term stopgap deals to insure themselves against injury and age (i.e. bring in Stephen Drew to spell the inevitable absence of Derek Jeter). But the tactic of signing Tanaka underscores that New York can’t afford to just be pretty good with marginal names. It needs cache and name recognition. Red Sox fans should be thrilled that a rival AL East team signed Tanaka as he is a good bet to be one of the most exciting pitchers to watch during the upcoming half decade or so. And all the while, the move isn’t likely to garner New York any competitive advantage over Boston. In the wake of New York’s deal with Tanaka, Lucky Larry just couldn’t resist belly-aching over the Yankees’ seemingly endless budget. Lucchino makes these comments just about every time Boston’s AL East rival announces a splashy free agent signing. Even in 2013, when the Red Sox trimmed their Opening Day payroll from $175 million to $155 million, they had the fourth-largest Opening Day payroll behind only the Yankees, Dodgers and Phillies. They’re not exactly the Pirates or A’s here. For all the accolades given to the Red Sox for their 2012-2013 offseason when they went after second-tier free agents like Shane Victorino, Mike Napoli and Jonny Gomes, let’s be honest here: They still bought those players. You don’t think the Pirates are smart enough to know they could have improved their club this winter with a couple of strategic free-agent signings? You don’t think the Rays would just once want to sign a free agent that costs more than the Red Sox pay for a part-time left fielder? It’s difficult not to take Lucky’s comments as the kinds of pointed opinions PR-minded dudes like Lucchino employ to rile up its bottom line – the ticket-buying, apparel-purchasing section of the fanbase. We have a difficult time thinking he even truly believes it. The Yankees more or less bought a World Series in 2009 but have otherwise seen very little correlation between success and bloated contracts, payrolls or luxury tax payments. Lucchino only further exposes himself as a phony – if that’s even possible at this point – when he comes out with such a disingenuous assessment of other teams’ fiscal behavior – especially in matters relating to the rival Yankees. The Red Sox boast a top 5 farm system right now – maybe even vying for one of the best depending who you ask. It has a lot of young talent that will be price-controlled and will likely mitigate any need to make the kinds of nine-figure signings the Yankees and other big market clubs like Anaheim have been inking lately. Based on this enviable position, the team will almost certainly use the savings to supplement that talent by overpaying some higher-visibility, recognizable free agents and to looking toward various contract extensions with marketable superstars (Lester, Ortiz, etc.) already on the roster. The money has been there ever since the John Henry regime took over in 2002. There is no reason why this ballclub, with three World Series championships in 10 years next to just one for New York, needs to falsely pump itself up as some kind of model for relative fiscal restraint. 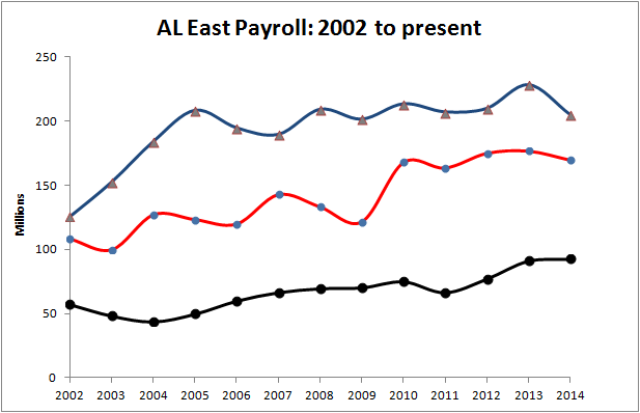 As shown in the chart below, the payrolls for the Yankees and the Red Sox are indeed in a different stratosphere. However, averaging Tampa Bay, Toronto and Baltimore’s yearly payroll (the black line), Boston is clearly trending closer and closer toward the ceiling set by New York and distancing itself from the other three teams in the division. This entry was posted in Uncategorized and tagged David Ortiz, Grady Sizemore, Larry Lucchino. Bookmark the permalink.